Wedding preparation is a long process that requires attention and imagination. As a rule, newlyweds tend to make their wedding ceremony really memorable for every guest. First, Is very important to take care about the special design of invitations, because of their appearance depends the initial impression. The most memorable in the invitation is a beautiful, elegant font, with sweeping strokes or miniature flowers, all depends upon the theme of the celebration and the desire of the newlyweds. Wedding fonts always look especially fancy and sacramental cause they include a lot of decorative elements – feature monograms, heartlet, wings and cute letterings. Most wedding fonts are executed “by hand”, or simply put in italics, accommodate the artful design and transitions from one letter to another. Such fonts are characterized by graceful curls and other fine decorations that delight the reader’s eye. Wedding’s italics are loved by the newlyweds for the fact that this font gives the illusion that it seemed to be done personally for the recipient. This is the advantage of wedding handwritten fonts, in their sacred, personalization and focus on the reader. The very purpose of such headsets is to create a good mood for guests and heroes of the occasion and to maintain the festive mood in General. 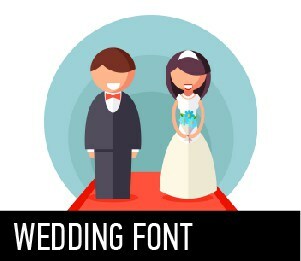 Here is the category where you can find the most beautiful, glamorous and interesting samples of wedding fonts. Using them you can easily make layouts in different graphic and text editors and print the final project hereafter. These gorgeous fonts can be sufficiently used in wedding scrolls, greeting and invitation letters, boxes and packaging for gifts, name cards, and other accessories.